Frank and Hazel in Disney. 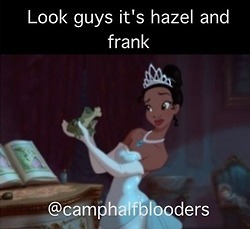 Frank and Hazel getting confused with Disney. Wallpaper and background images in the The Heroes of Olympus club tagged: photo frank hazel frazel frog princess princess and the frog rick riordan heroes of olympus. This The Heroes of Olympus photo contains teken, poster, tekst, bord, and schoolbord. There might also be anime, grappig boek, manga, cartoon, stripboek, portret, headshot, and close-up. Hahaha! Lol how do you come up with this stuff?